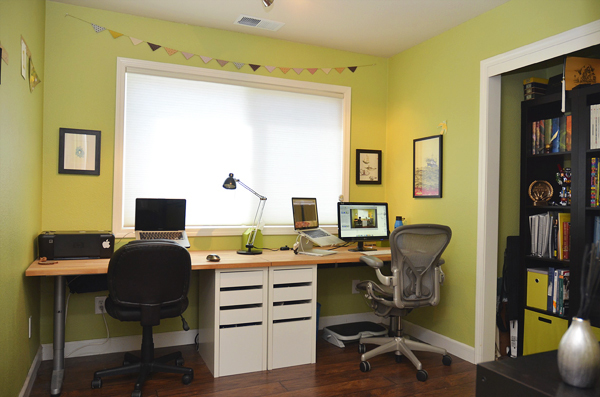 We were shopping for a way to include two workspaces in a little 10x10 ft room. We also wanted to have a desk that looked as if it was custom built for the room. So we bought 2 of everything below, cut down the Vika Byske to size and now we have a built in desk! I think it looks pretty good! It looks like it was custom made for the space. 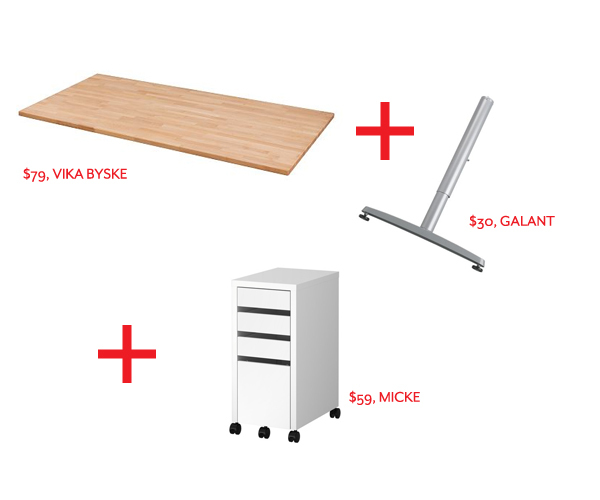 The Galant Legs hold up the left and right side of the desk and the Micke holds up the middle. We decided on Galant legs, because the height is adjustable, so the height of the drawer unit wouldn't have to match the height of the legs. We wanted to get one single piece for the table top, but they didn't carry one that long. I suppose we could have bought a longer piece of wood somewhere else, but we were worried about the price, and the two pieces look fairly seamless anyway. We also made a large hole in the back left and right corner for the wires. FYI I despise the chair on the left. It's on its way out, I just haven't found a replacement for it yet. I'm also looking for a place to keep the printers. There isn't enough room under the desk, so I need to come up with something else. I'll update if I happen to find a solution. UPDATE: Normally the Micke comes with casters attached to the bottom of the cabinet, but we didn't want the casters. So we removed them all together. The only problem was that the bottom drawers would scrape when we opened it. because there is no space between the bottom of the drawer and the floor. So we added Heavy Duty Felt Strips on the left and right side of the cabinets, and now the bottom drawer opens perfectly! It just needed a tiny bit of space to be able to open. excellent idea!!!! I will definitely take it! What did you use to secure the table top to the pieces? The Galant legs are secured with the the hardware that comes with the legs. We just drilled directly into the wood. The Galant legs come with a frame that secures to the bottom of the desk. I had to ask someone at Ikea to make sure I had all the pieces. In the center, the desk is just resting on the Micke. We toyed with the idea of using a screw or bolt to secure the center of the desk also, but the weight of the desk keeps it pretty stable. Did you use any of the wood oil treatment they recommend or sand them? I didn't do anything to the wood. I remember seeing two kinds of table tops at IKEA. One was finished and one was unfinished. The finished one was more expensive at $79. But even though this is supposed to be finished wood, it doesn't seem to be completely sealed. So far, so good though. We've had the desk for about 8 months or so and we haven't had any problems. I have to agree that it really looks like it was custom-made for the space you have. And its color blends smoothly to the colors of the space. It’s very inspiring! I really like how it looks, you did a great job. Could you tell me how you solved the problem of the desk top being about 10 inches deeper than Micke? Do you have that much overhang? How tall are the micke's w/o the casters? They are about 27.5 inches tall without the casters. How did you remove the castors? I just didn't install them when I built it. You have to put them on yourself. Can you share the height of the Mike cabinet without the casters? I'm trying to determine if the height listed online 29.5'' is with or without the casters! Sure m, they’re 27.5 inches without the castors.